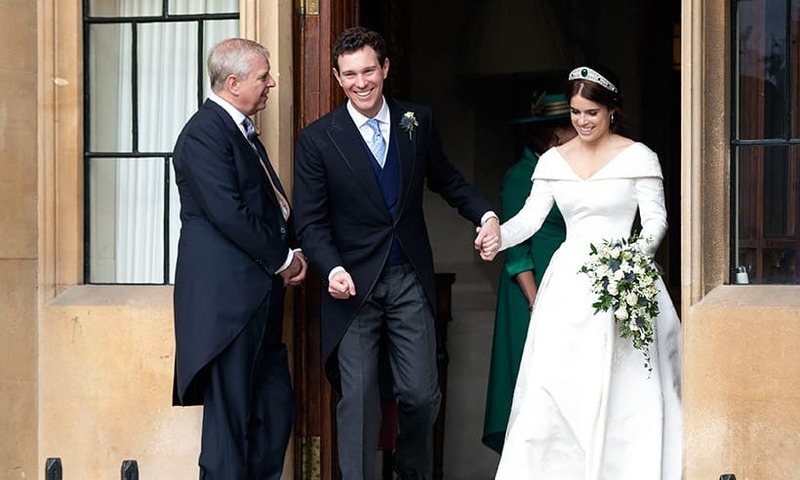 The Wedding of Princess Eugenie and Jack Brooksbank took place on Friday, October 12, 2018, in Windsor, England. 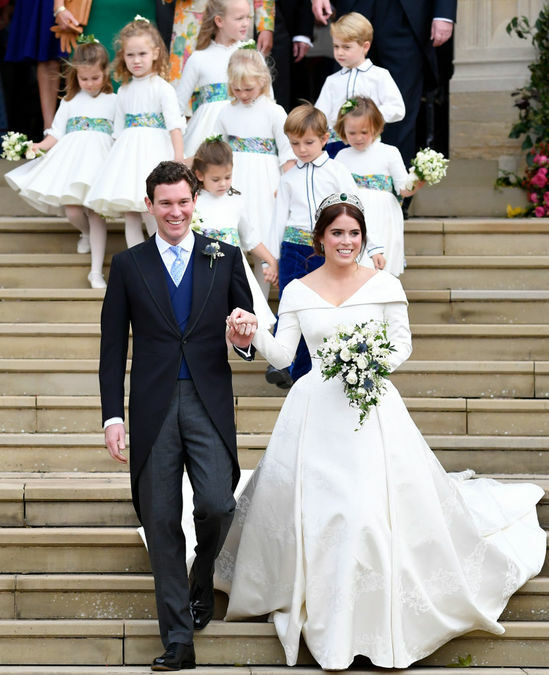 Princess Eugenie’s bridal gown was designed by Peter Pilotto and Christopher De Vos. The gown featured a neckline that folded around the shoulders and dipped into a low back. It had long sleeves and a cathedral length train. 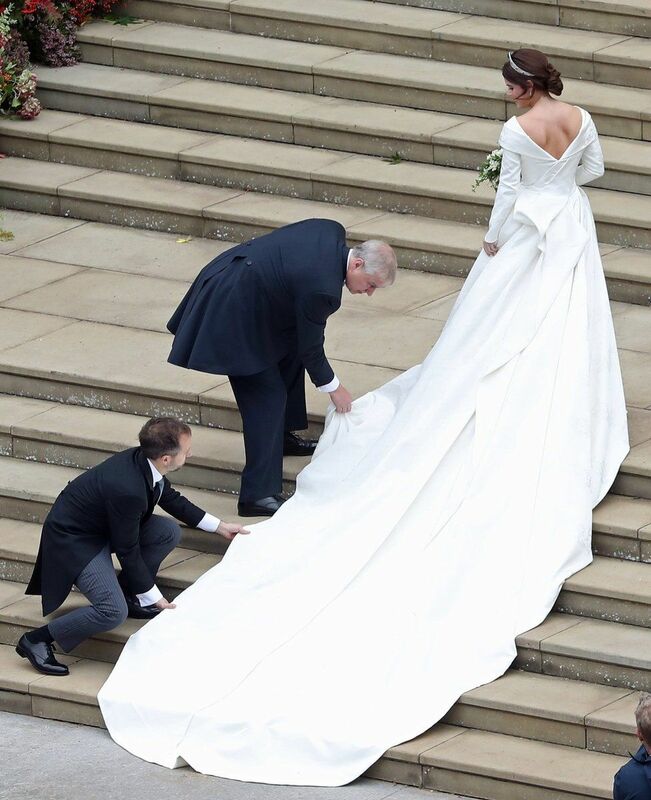 The true beauty of the dress was the fabric. It was a silk, cotton, and viscose blend which was woven into a jacquard fabric. The jacquard weave was made in the Como region of Italy. It featured rope-like motifs with deep personal meaning. Thistles represented Scotland and the couple’s fondness for Balmoral, the Queen’s private Scottish estate. Shamrocks acknowledged Ireland and her mother’s Ferguson heritage. Other symbols were the York Rose – a nod to the princess’s family name of York and ivy, which represents the couple’s home, Ivy Cottage, in Kensington Palace. She was escorted by her father, The Duke of York. Prince Andrew is Queen Elizbeth’s second son. He was an absolutely doting father, repeatedly adjusting his daughter’s lovely train. Princess Eugenie had major surgery on her back to treat a curvature of the spine at the age of 12. The amazing princess said she hoped showing her scar would honor those who had helped her and inspire others with the condition of scoliosis. The bride wore the Greville Emerald Kokoshnik tiara, which was lent to her by the Queen. It had not been seen publicly in over 76 years. The tiara was made in 1919 by the jeweler Boucheron. It was created for British society hostess Dame Margaret Greville. The fashionable “kokoshnik” style was popularised by the Russian Imperial Court. Dame Greville bequeathed the tiara to the Queen Mother upon her death in 1942. The tiara is designed with brilliant and rose-cut diamonds pavé set in platinum. It features six emeralds on either side. The center emerald is a stunning 93.70 carats. 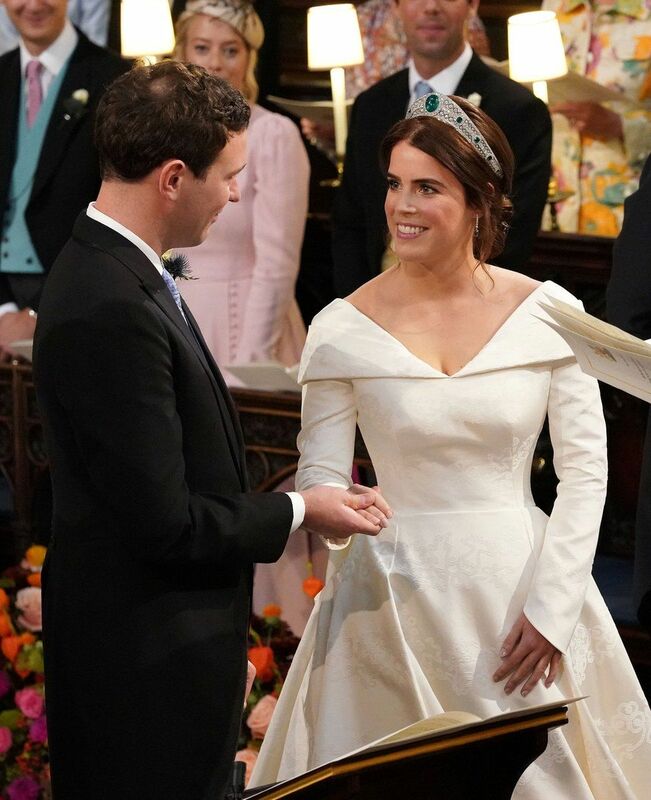 Princess Eugenie also wore diamond and emerald drop earrings which were a wedding gift from the groom. The bridal bouquet consisted of Lily of the Valley, Stephanotis pips, baby blue thistles, white spray roses, and trailing ivy. A sprig of myrtle from Osbourne House was also included in the bouquet. The tradition of carrying myrtle began after Queen Victoria was given a nosegay containing myrtle by Prince Albert’s grandmother during a visit to Gotha in Germany. That same year, in 1845, Queen Victoria and Prince Albert bought Osborne House as a family retreat. A sprig from the posy was planted against the terrace walls, where it still thrives today. The myrtle sprig was first carried by Queen Victoria’s eldest daughter, Princess Victoria when she was married in 1858. 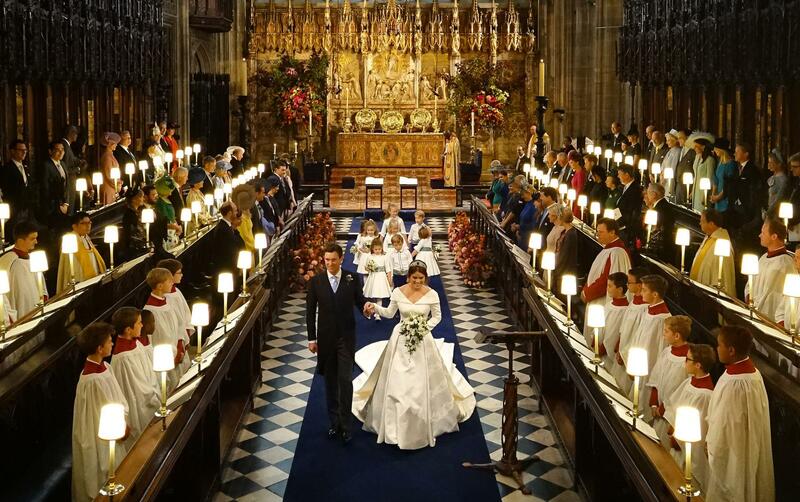 The wedding flowers were created by floral designer Rob Van Helden and his sister, Patrice Van Helden Oakes. 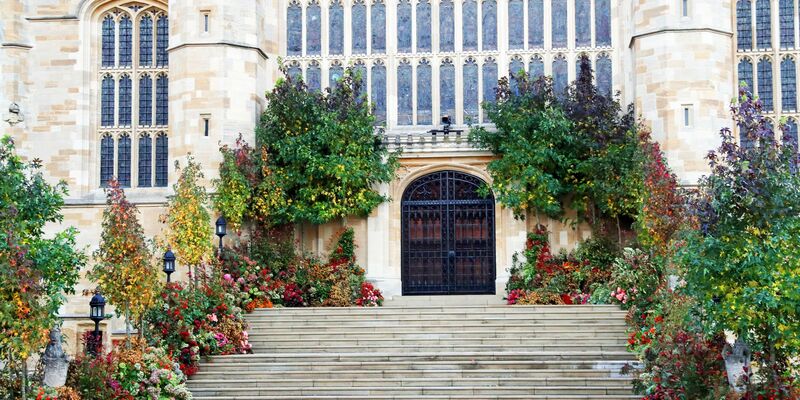 The floral displays on the exterior and interior of St George’s Chapel were created using foliage and flowering branches sourced locally from Windsor Great Park. A combination of roses, spray roses, hydrangeas, dahlias, and berries were used, as well as Liquid Amber trees. The designs reflected the rich and vibrant tones of autumn. Jack Christopher Stamp Brooksbank wed his princess in a traditional British morning coat. As he had no prior military service a uniform was not an option. His royal blue vest (waistcoat) was designed in a double-breasted style. His light blue silk tie sported a tie pin that featured the white rose of York. This was a nod to Eugenie’s family. It also had a pink padparadscha sapphire which is the same gem used for Eugenie’s engagement ring. It was a wedding gift from the bride’s mother Sarah, Duchess of York. 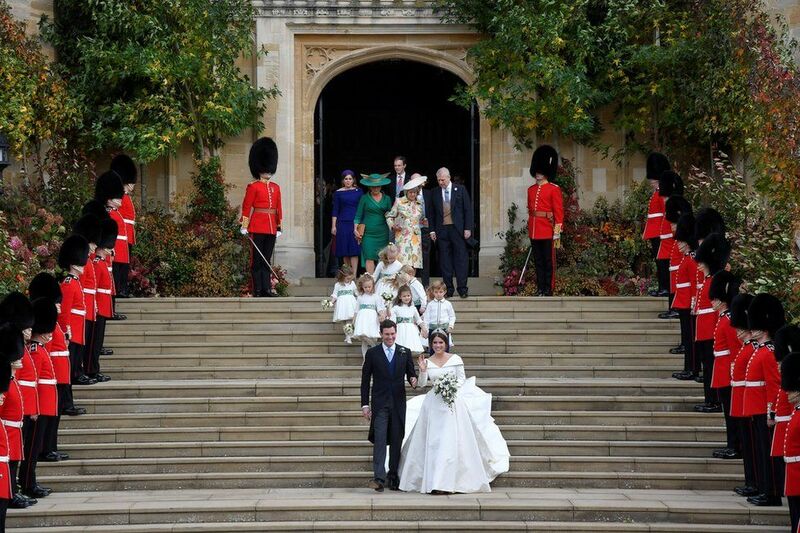 The bridal party included many of Princess Eugenie’s cousins. Prince George and Princess Charlotte who are the children of the Duke and Duchess of Cambridge. 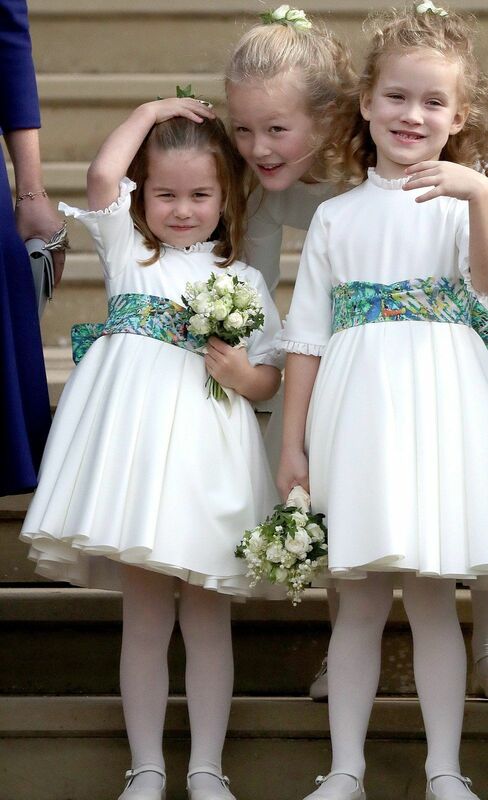 Savannah and Isla Philips children of Peter and Autumn Phillips/grandchildren of Princess Royal, Anne. 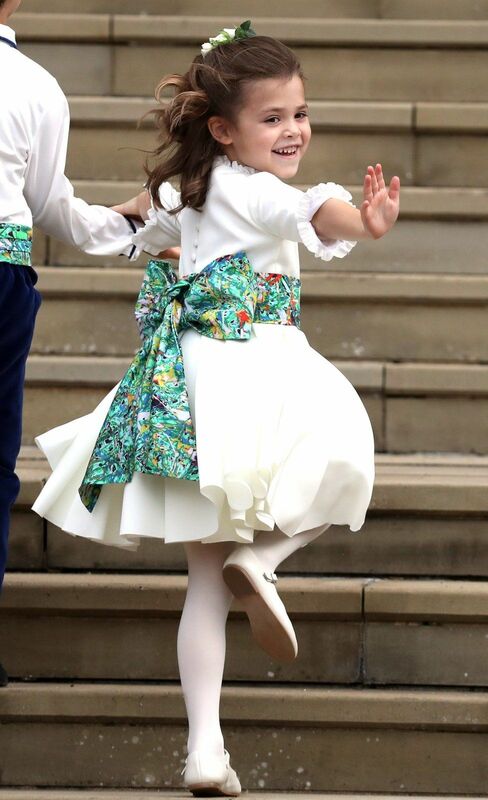 Mia Tindall daughter of Zara and Mike Tindall/grandchildren of Princess Royal, Anne. Maud Windsor, daughter of Lord and Lady Frederick Windsor. As well as the children of family friends, Louis de Givenchy, son of Zoë and Olivier de Givenchy and Theodora Williams, daughter of Robbie Williams and Ayda Fields. The bridesmaids and pageboys wore clothing designed by Amaia Arrieta of Amaia Kids. The sash design incorporated Mark Bradford artwork, which was also included on the last page in the Order of Service program for the wedding. The bridesmaids carried bouquets of Lily of the Valley and spray roses designed by Rob Van Helden which evoked similar elements of the bride’s bouquet. The couple also had two special attendants, Lady Louise Windsor, and James Viscount Severn. Both are the children of Prince Edward, Queen Elizabeth’s youngest son. Jack’s brother, Thomas, served as his best man. Lady Louise wore a royal blue dress designed by Claudie Pierlot and a hat designed by Emily London. 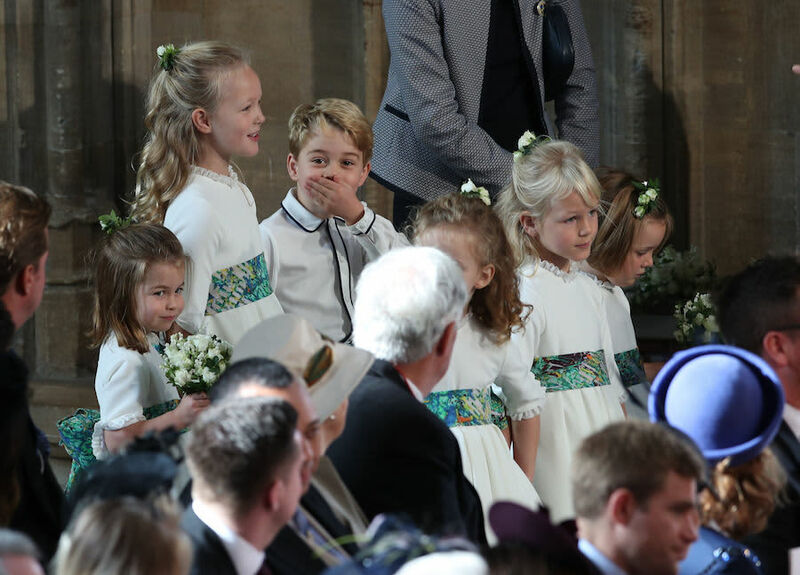 One of my favorite moments from the wedding was when Prince George spied the bride. The service was held in St. George’s Chapel. The arrival of the bride was signaled with fanfare played by trumpeters from the band of the Household Cavalry. The Dean of Windsor led the exchange of vows. There were performances by Andrea Bocelli and the London Symphony Orchestra. Princess Beatrice delivered an emotional reading from F. Scott Fitzgerald’s The Great Gatsby. The passage describes Jay Gatsby’s smile, as he meets Nick Carraway for the first time. The bride said it reminded her of her groom. 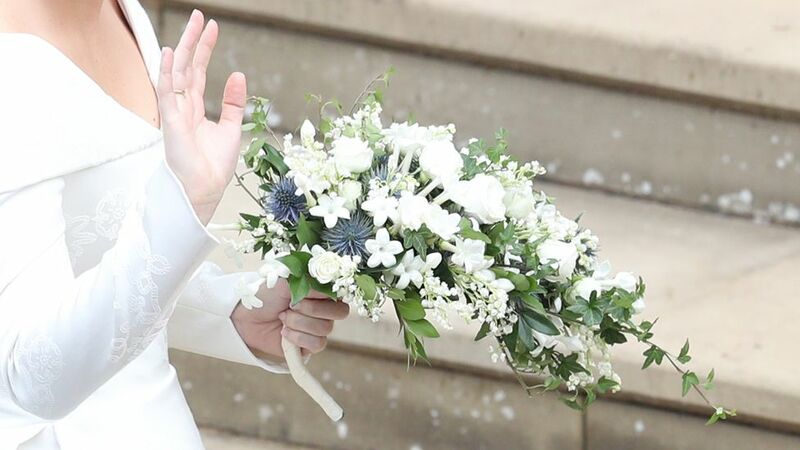 Princess Eugenie’s wedding band is made from Welsh gold. Traditionally, the wedding rings of royal brides have been made from nuggets from the Clogau St David’s mine at Bontddu, North Wales. The Archbishop of York led the prayers before the register was signed. The newly married couple proceeded down the aisle and out onto the Galilee Porch. The couple delighted the crowds with their first kiss. As the couple departed the chapel, the steps were lined with members of the Grenadier Guards. Prince Andrew, the bride’s father, is a colonel with the guards. The couple rode in the Scottish State Coach as it was a blustery day. Their carriage traveled through Windsor High Street and the Long Walk to an afternoon reception hosted by the Queen in St George’s Hall at the castle. The carriage was pulled by four Windsor Grey horses, Plymouth, Milford Haven, Tyrone, and Storm. The bride’s mother, Sarah, Duchess of York, wore a green dress by Emma Louise Design. 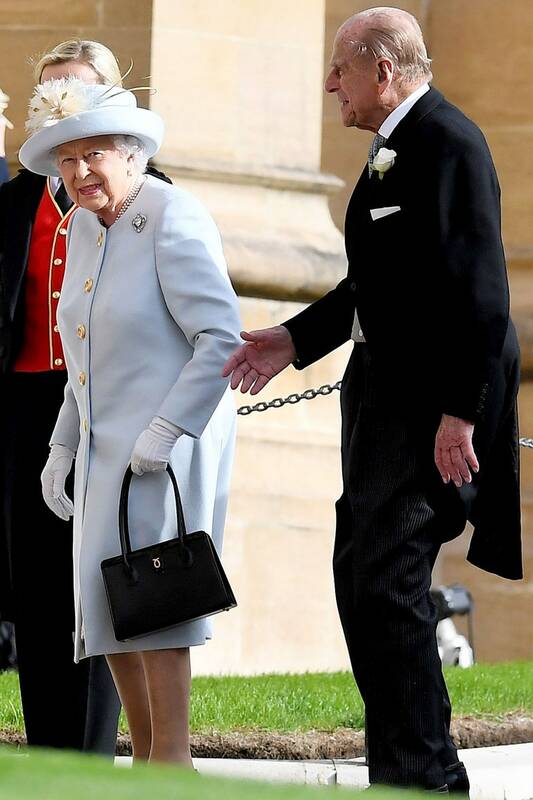 She touchingly carried the same vintage Manolo Blahnik bag that her mother used at her wedding to the Duke. Her hat is by Jess Collett Hats. The bride’s sister wore a purple dress by Ralph & Russo. It was paired with a complementary purple headband by Sarah Cant. The groom’s parents, Nicola and George Brooksbank. 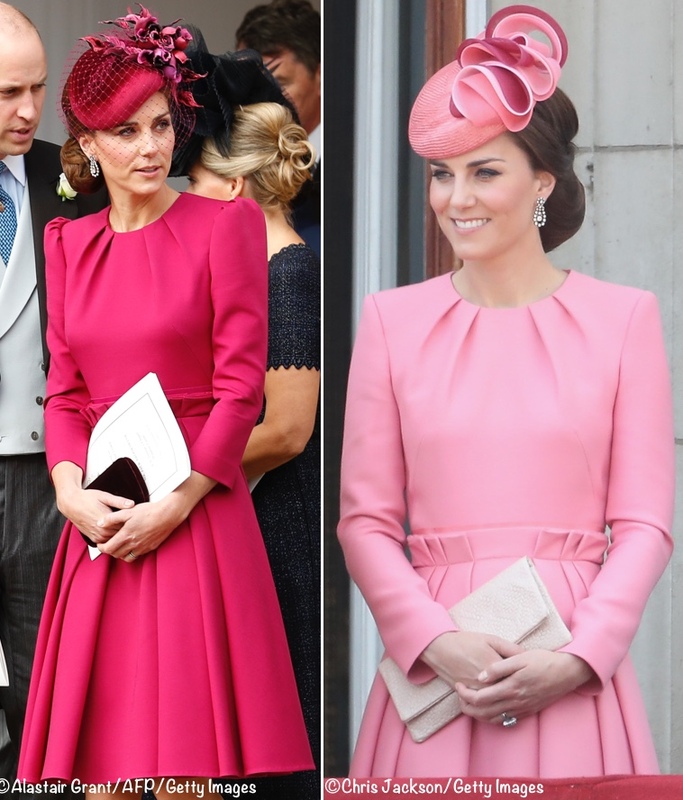 Catherine wore a fuschia dress by Alexander McQueen. She paired the look with a hat by Philip Treacy. The Diamond Pendant earrings were loaned to her by the Queen. The ensemble was very similar to a look she wore to the Trooping the Color in 2017. I suspect she purposely did this to not take away from Eugenie’s day in any way. The Duchess’ sister, Pippa, attended with her husband James Middleton. She looked lovely in a green Emilia Wickstead dress. She is due later this fall with their first child. 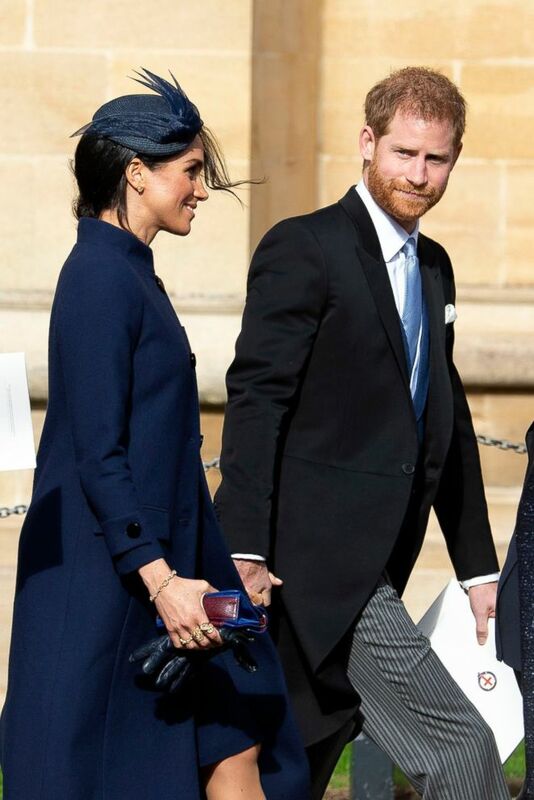 Meghan wore a navy blue dress by Givenchy and a hat by Jane Taylor, a London-based milliner. There were also several celebrities in attendance including Demi Moore. Liv Tyler looked elegant in a navy suit. It was a delight to see the Queen and Prince Philip. He has been in ill health lately and it wasn’t sure if he would attend. The Queen wore the Cullinan V Heart Diamond brooch on her pale blue coat. The brooch was designed for Queen Mary in 1911. The center stone is about 19 carats. The luncheon reception was hosted by the Queen in St George’s Hall at the castle. The cake was a red velvet and chocolate design by London-based baker Sophie Cabot. The edible accents included various berries and sugar ivy, in a nod to Eugenie and Jack’s new home, Ivy Cottage at Kensington Palace. A spectacular cake in a spectacular setting! The couple drove away from the reception in a genuine James Bond car. The silver DB10 was originally made for the James Bond movie Spectre. Later in the evening, the couple hosted a festival themed event at Royal Lodge in Windsor Great Park. Zac Posen designed the brides dress for this event. I liked her dress better than those of the two duchesses! And I hope that showing her scar will inspire others to make sure that their children are evaluated for scoliosis and lordosis, to get treatment if necessary, and to be proud of the scars that result. I remember a girl from my childhood who always wore a shirt to cover hers, but better to be proud of the bravery needed to endure! The altar flowers were gorgeous with the lantern flowers and berries. Also I believe the nonroyal children were Jack’s godchildren. I had not even heard of this wedding! Thanks for the details. Lovely! Thanks so much for this wonderful post. I missed the broadcast, so this was such a treat. What a wonderful post, Laura! I love looking at all things Royal and so fun to learn about all the interesting details. sensible flats. Welcome to my world! I always look forward to your blogs on the royals. You are so detailed and I always learn something. I loved the tiarra and earring worn by the princess. I have always loved green emeralds. I think we should see that tiarra more often. I bought a fascinator earlier this year and will be wearing it to a few weddings this year. Fun! I’m so happy you mentioned Princess Eugenie’s story behind her scar and no veil. When I saw the BBC photos on Saturday, I knew immediately what that scar was. As a teen with scoliosis, I wore the Milwaukee brace 23/24 hrs/day for 3 yrs to avoid that surgery. The techniques improved so much over the years; gone are the days of ghastly cuts/scars and post surgical body cast for a year! The princess and entourage were lovely. I especially loved the children’s attire and Eugenie’s evening dress by Zac Posen. Thanks for sharing this, Laura, blogland ‘s go-to for all things Royal family! You & I always love a Royal Wedding don’t we! I think her wedding dress was the most successful of the three recent brides. It looked timeless, almost medieval. Only she, as a royal princess could get away with wearing only a tiara and it looked fantastic on her. I know that times have changed, but to see Meghan wearing a veil just did not get it for me. They are supposed to symbolize innocense and purity. No more. 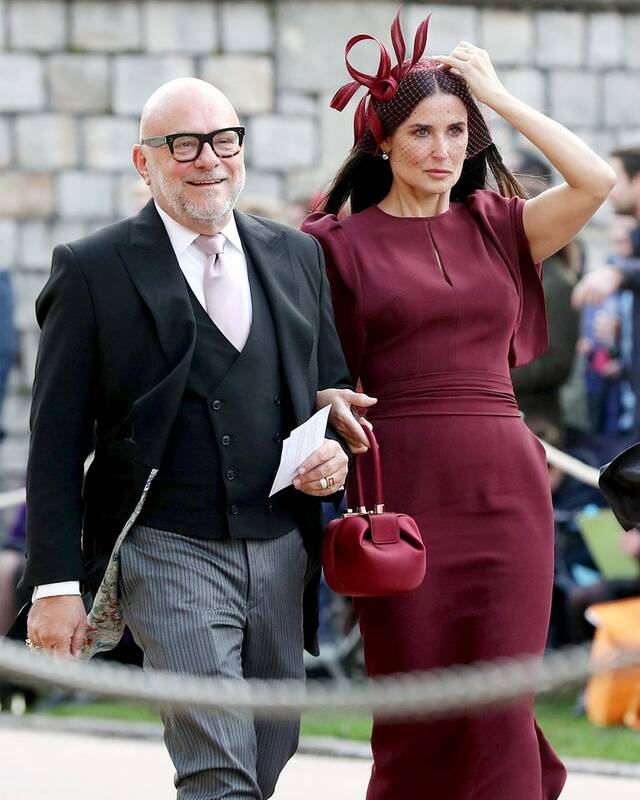 Eugenie’s look was perfect. I always love your royal posts and share them with friends and family that aren’t bloggers. Thank you for all the work putting your posts together. Another wonderful post, Laura. I appreciate all the work that goes into preparing a post such as this. It was a beautiful wedding and I wish the couple much joy. Lovely collection of photos. Different from the ones I had seen. I had wondered why Megan looked so dowdy and mumsy and sure enough on Monday Kensington announces a pregnancy. I knew it! I’m glad they waited until after the wedding to announce it. 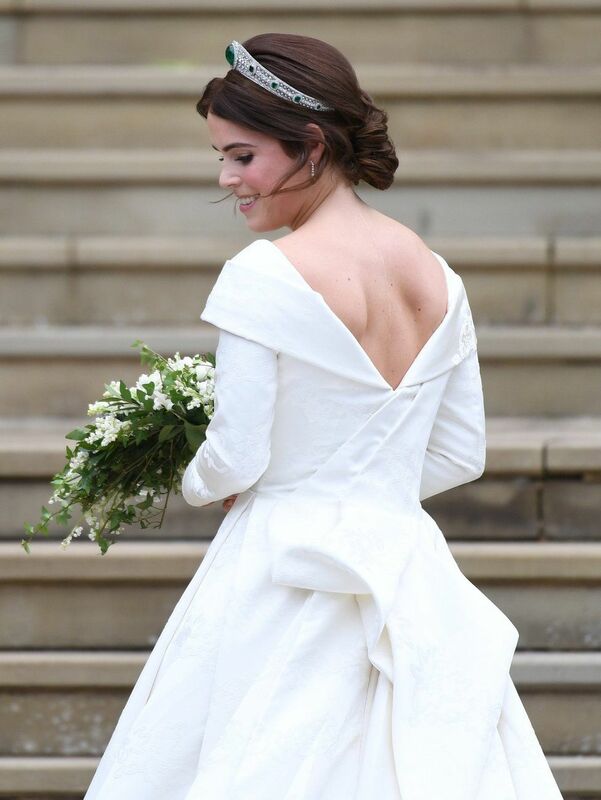 It was a beautiful wedding fit for a princess! Every picture you have is perfect. Whenever I hear of a new royal wedding, I know that I can get a very detailed look here. I don’t even look on news sites, I come straight here. Laura, thank you so much for all the work you put into these Royal posts. 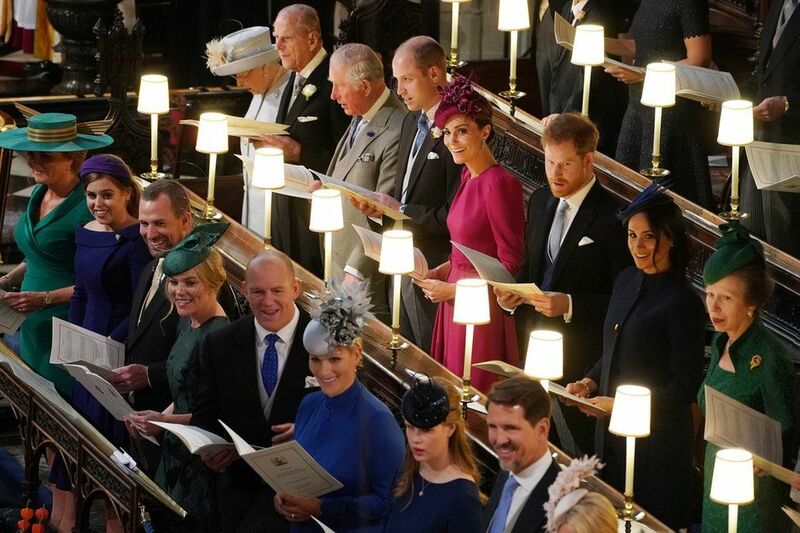 As a confirmed Anglophile, I really enjoyed seeing this as I missed the broadcast. When I was a child, my mother’s friend had an English penpal who forwarded her magazines; they were handed on after we read them enthusiastically! Glad I outgrew my crush on Prince Charles! So many beautiful chambers! I love all of the children too. Thanks for sharing with SYC. This was going on as we were there but was pretty low key, whichsurprised me. Didn’t hear much about it till the papers the next day. (If I’d known, I might have watched!) I thought she looked just lovely. I have to say your posts on these are fabulous! You should be hired as a royal writer — far better than some I see that I know are on the payroll!